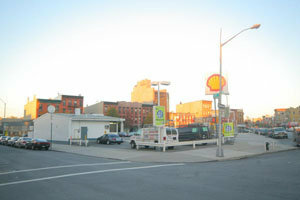 Brownstoner reported earlier this week on the potential development of the former Shell station on the four-sided triangle at Grand, Keap, South 1st and Borinquen. The developers of the property are saying that they will build a two-story “retail strip center” in phase one and an “apartment tower” in a future phase. In the old days, a two-story retail strip center would be called a taxpayer – those one- and two-story retail buildings that you see throughout the city, particularly from the 1930s through 1950s. They are a way for developers to put a property to some use and at least cover the costs of carrying a property until better times come along (and from the neighborhood’s point of view, that is a big improvement over a vacant lot or an abandoned gas station). At this point, though, DOB permits have been pulled for demolishing the former gas station on the site. There are no applications listed on BIS for building anything – retail strip or apartment building. And according to the comment thread on this Real Deal posting, the developers are strapped for cash and don’t even own the property (they have a net lease). So the near-term potential sure looks good for this turning from an abandoned gas station to a vacant lot.